Hello and welcome to our new monthly feature, Upcoming Events Near You! This regular Daily Illuminator feature will let you know what local game-store events to expect in the coming month or two so that you can pencil them in on your calendar. May and June will be exciting months for the Munchkin Collectible Card Game. In May, we've got a dozen stores running Sealed & Dealed Events to offer players a new booster-licious format. Later in the month, the stores below will run a pre-release event for our first expansion, the Desolation of Blarg! Check to see if there's a location near you! Then, at the end of May and throughout June, the Regional level of our 2018 Championship Tournament Series goes off around the country. 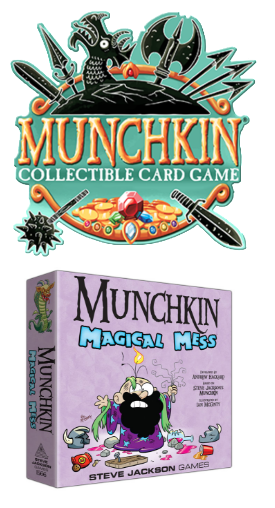 And if classic Munchkin is more your speed, 2nd & Charles stores will run Munchkin Magical Mess Learn-To-Play Events on May 19! Want to play the Munchkin CCG in a sealed format? Check out the Sealed & Dealed events at the stores below! 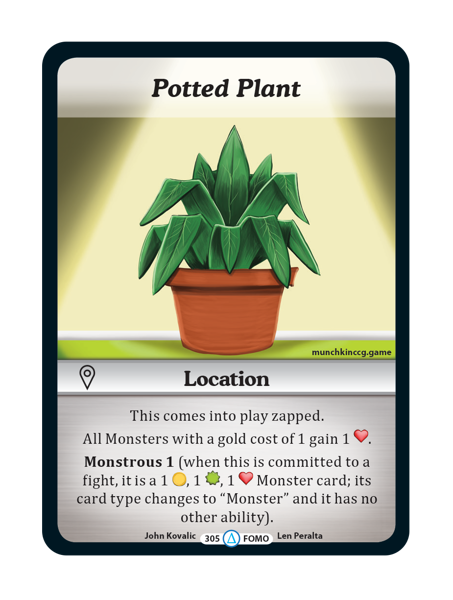 Each of these events will feature a 6-pack sealed tournament with promo cards - including the brand new, never-before-seen Potted Plant! So go get your Potted Plants and some new booster packs. Oh, and these events are new-player friendly, so be sure to let your friends know they can come learn to play. We're doing a limited series of pre-release events for the Munchkin CCG's first expansion, in select locations! The Desolation of Blarg comes out May 30, but if you're in one of the three following areas, you can play it earlier. For each event, there will be a learn-to-play followed by a pre-release event, so you can bring your friends even if they haven't taken the plunge yet! The first time listed for these events is for the learn-to-play event; the second time listed is for the pre-release. Most of these have limited seats, so get signed up today! Saturday, May 26, at 10 a.m. and 12 p.m.
Sunday, May 27, at 11:30 a.m. and 1 p.m.
Thursday, May 24 at 6 p.m. and 7:30 p.m.
Saturday, May 26, at 1 p.m. and 3 p.m.
Sunday, May 27, at 1 p.m. and 3 p.m.
Sunday, May 27, at 11 a.m. and 1 p.m.
Friday, May 25, at 5 p.m. and 7 p.m.
That mischeivous magician Moop is mixing up monsters! Maraud to make him meet his match! Get into the fun of this delightfully pun-ny and portmanteau-licious version of Munchkin at a 2nd & Charles store near you. You'll be able to learn to play, get a game in, and get some free loot to boot. Watch this blog in the next week or so for a full list of almost 40 locations nationwide! We posted last month about our upcoming Regional Championship Tournaments and the great, limited prizes winners will get there. So if you think your Munchkin CCG skills are some of the best around, here's your chance to prove it! Just find the closest Regional to you and mark your calendar! Nearly 200 stores ran excellent Munchkin Collectible Card Game Day of Wreckoning events in April, and now it's time to gear up for the next big play event. This one is tied to the release of The Desolation of Blarg, our very first expansion. Expect to see stores running draft events, sealed events, or casual-play events with cards featuring this new set. Each store should also have some brand new, never-before-seen promo cards for you! Sign up for the Spotlight, our newsletter, to be sure that we'll notify you when the full list of local game stores running this event goes up.